Buckingham Oversize Pad Climber Pad. This Buckingham pad eliminates rivets entirely. 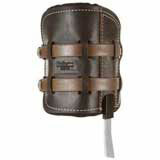 Its 9" width and thick felt padding make it one of the most comfortable leather pads available. The rolled edge helps to eliminate rubbing and chafing. Requires 2prs - #2639 - 1" x 26" Nylon straps.